Meet Clementine the Bear. 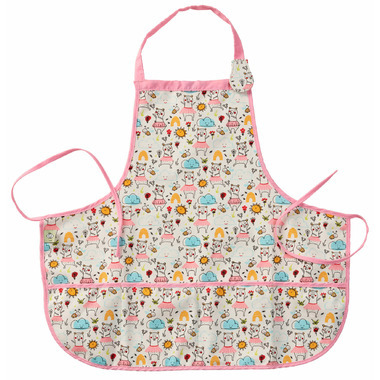 The Kiddie Apron features Sweet Clementine dancing with her happy friends - the cloud, the sun, and the bee! Creativity can sometimes be messy, but that’s often part of the fun. Give little chefs, small artists, and petite gardeners freedom to experiment with the Kiddie Apron. Kiddie Aprons are made of durable, soft cotton-canvas with a washable waterproof coating. Child friendly magnetic-snap closure makes it easy for toddlers or preschoolers to put on or take off. The apron features four handy pockets and cotton-piping back-tie, as well as a re-usable cotton-canvas pouch for storage.